greenKnows/石月 エ一ロ（Ishitsuki Eichiro）: What is the meaning of the phrase "ontogeny recapitulates phylogeny"? 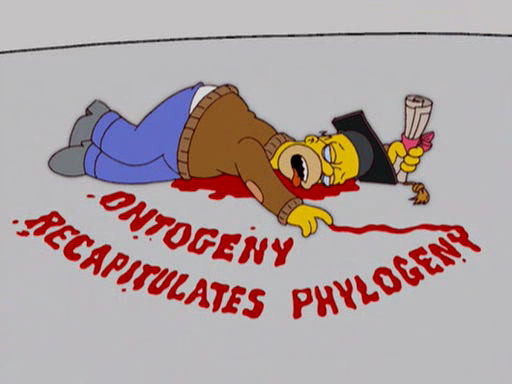 What is the meaning of the phrase "ontogeny recapitulates phylogeny"? Ontogeny is the course of development of an organism from fertilized egg to adult; phylogeny is the evolutionary history of a group of organisms. The phrase "ontogeny recapitulates phylogeny" originated with Ernst Haeckel (1834-1919). It means that as an embryo of an advanced organism grows, it will pass through stages that look very much like the adult phase of less-advanced organisms. For example, at one point each human embryo has gills and resembles a tadpole. Although further research demonstrated that early stage embryos are not representative of our evolutionary ancestors, Haeckel's general concept that the developmental process reveals some clues about evolutionary history is certainly true. Animals with recent common ancestors tend to share more similarity during development than those that do not. A dog embryo and a pig embryo will look more alike through most stages of development than a dog embryo and a salamander embryo, for example.